Let’s Encrypt is a Certificate Authority (CA) that provides an easy way to obtain and install free TLS/SSL certificates. 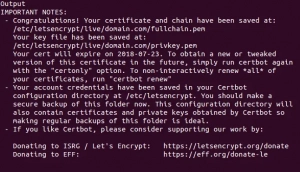 We are using Certbot to obtain a free SSL certificate for Nginx with Ubuntu set up. It’s better to use separate Nginx server block file instead of the default file. An A record and www record for the required domain name. 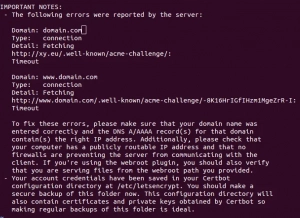 Certbot is now ready to use, but we need to configure SSL for Nginx. If this step failed with the following error, make sure the domain has no IPv6 records ( AAAA record) Let’s Encrypt prefers IPv6 over IPv4. If you see no errors, you’re all set. When necessary, Certbot will renew your certificates and reload Nginx to pick up the changes. This entry was posted in django, flask, letsencrypt, nginx. Bookmark the permalink.